Some Trotskyist "solidarity" from the Asia-Pacific region for the unfolding Egyptian and Tunisian revolutions. 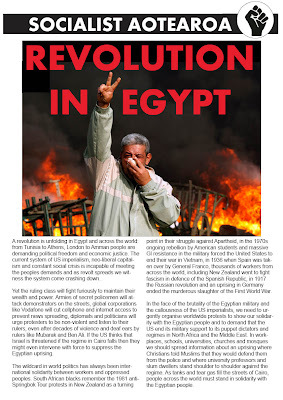 January 29, 2011 -- The Socialist Party of Malaysia (PSM) would like to express its solidarity with the revolutionary masses in Egypt, as well as in Tunisia and other countries in North Africa and the Middle East, for their courageous struggle against repressive regimes which are mostly backed by US-led imperialist powers. All repressive regimes and those who collude with imperialist powers must go. The people of Tunisia and Egypt have shown the way and more nations will follow their footsteps. Like the past revolutions which have brought dramatic change to the world and the ongoing revolutionary struggles in Latin America, the people's revolution in Tunisia and Egypt will continue to inspire people around the world to revive their fighting tradition and stand up against powerful ruling elites who collude with imperialist powers, and to build a better world from below. January 29, 2011 -- The progressive movement and peoples of the Philippines stands in solidarity with the Egyptian people and the mass movement in the streets in these critical moments in their struggle for the ouster of the dictatorial Mubarak regime. Revolutionary flames are sweeping across the Arab world. Yesterday Tunisia removed a barbaric dictator. Today is for Egypt. Tomorrow is for Palestine and all those in the Middle East struggling against dictatorships and exploitation and oppression. Long live the revival of genuine peoples popular power in the Middle East! Long live the revolution in the Middle East! 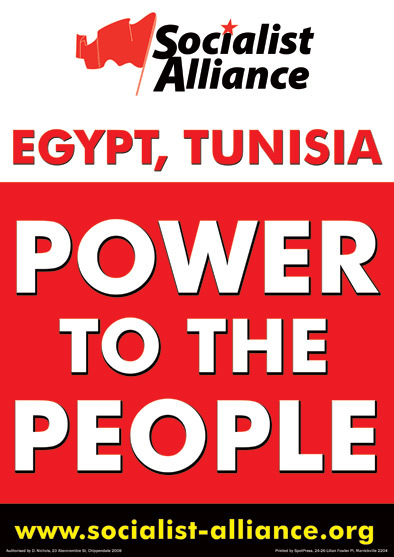 January 29, 2011 -- The Socialist Alliance applauds the courage and tenacity of the Tunisian people, whose protests for democracy and economic and social justice, now in their second month, have ended the 23-year rule of dictator Zine El Abidine Ben Ali. The Tunisian revolution has inspired ordinary people across the Arab world and protests have broken out in Algeria, Jordan, Yemen and, most dramatically, against the United States-backed dictatorship in Egypt. The Egyptian and Tunisian uprisings are not just against Western-backed dictators. They are against an unjust global economic system based on the plunder of the human and natural resources of poor countries by Western corporations. The policies of multinational institutions like the International Monetary Fund and World Bank, faithfully implemented by Ben Ali and Hosni Mubarak, create poverty, unemployment and lack of opportunity for ordinary people. No Western interference in Tunisia. The Tunisian people have shown that it is they, and not the Western empires, who know what democracy means. The West to stop propping up the Mubarak dictatorship in Egypt, the second-largest recipient of US military aid in world (after Israel). An end to the ongoing Western military occupation of Iraq, and other Western military interference in the Arab world and the neighbouring region, including the occupation of Afghanistan and covert operations in Yemen and Somalia. The people of Tunisia and Egypt have shown the way and we believe that more nations will follow their footsteps. Like the past revolutions which have brought dramatic change to the world and the ongoing revolutionary struggles in Latin America, the people's revolution in Tunisia and Egypt will continue to inspire people around the world to revive their fighting tradition and stand up against powerful ruling elites who collude with imperialist powers, and to build a better world from below. We call on the masses of Pakistan to follow their brothers and sisters of Tunisia and Egypt. We call on the masses of Pakistan to overthrow the present pro-US imperialist capitalist feudal system and to elect a constituent assembly to do away from pro-IMF policies, to separate the state from religion, to dismantle feudalism, end of privatisation and a process of re-nationalisation, to grant right of self-determination to the nations, equal rights to the minorities, an end of all discriminatory laws against women and minorities and to demand an end of imperialist occupation of Iraq and Afghanistan. January 28, 2011 -- A revolution is unfolding in Egypt and across the world: from Tunisia to Athens, London to Amman people are demanding political freedom and economic justice. The current system of US imperialism, neo-liberal capitalism and constant social crisis is incapable of meeting the peoples demands and as revolt spreads we witness the system come crashing down. In the face of the brutality of the Egyptian military and the callousness of the US imperialists, we need to urgently organise worldwide protests to show our solidarity with the Egyptian people and to demand that the US end its military support to its puppet dictators and regimes in North Africa and the Middle East. In workplaces, schools, universities, churches and mosques we should spread information about an uprising where Christians told Muslims that they would defend them from the police and where university professors and slum dwellers stand shoulder to shoulder against the regime. As tanks and tear gas fill the streets of Cairo, people across the world must stand in solidarity with the Egyptian people. Yep -"democracy" is coming to the Middle East folks.